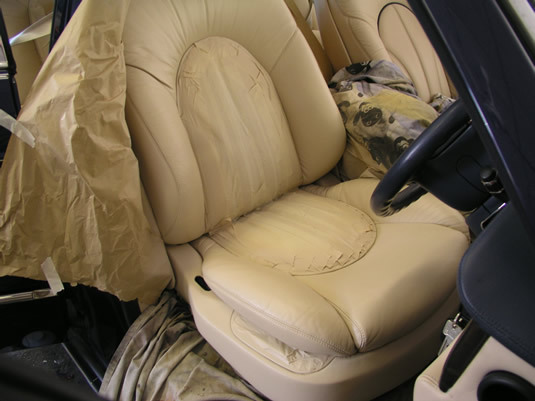 With just about any project we undertake, there is usually a 'main thing' that leads to the customer bringing the car to us, often its the leather. Above is the photo emailed to us by the customer of their leather. It all looked a little tired with creases and minor cracks, years of grime and discolouration. 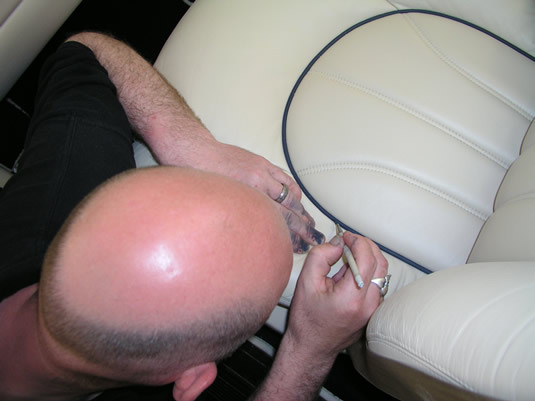 Fortunately, Rolls-Royce leather is second-to-none in quality, and despite any cracks, with proper preparation will provide a good solid base for recolouring. 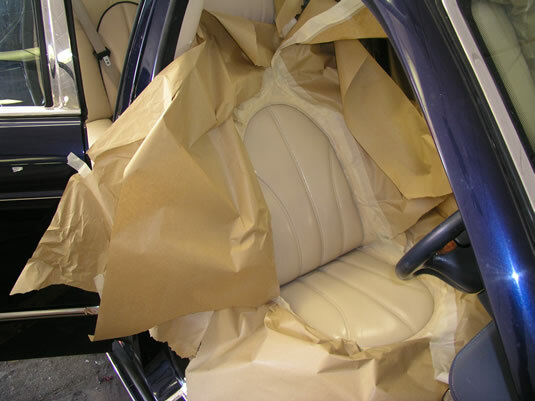 There is a lot of work involved in recolouring the seats in a car like this. Because of the blue piping, each seat is done in two stages. Firstly the blue piping with the centre section is masked, but only after the seat is cleaned in minute detail, and then prep'd to remove all the dead old colour. Once this is recoloured, the blue piping with the outer section will be masked. As with many such things, a quality job depends on the preparation. 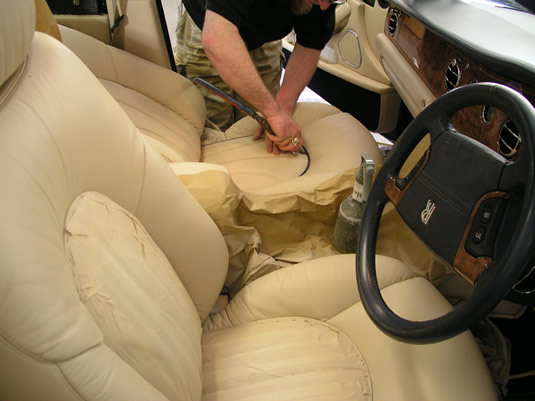 One of the most important things to do is get the seats absolutely clean and free from grit and dust which tends to build up between the seat panels and piping, and it's cleaned to remove grease and any acidic human contamination! This can be a problem, as we touch leather with our bare skin, our perspiration gets into it which is acidic -- you can often see it on leather steering wheels. A few years ago, when it was fashionable, we often had to deal with contamination from hair gel, more recently fake tan has been a problem. Next the leather is sanded to provide a surface that the new colour can key to. As with painting bodywork, there is no point in removing the original colour if it is good and solid, it's best to leave it on as if forms a strong undercoat. However, there were a couple of areas where there were cracks and crazing in the coating. This really needs to be removed because over time these cracks will extend down into the actual leather, so on these areas it was sanded back all the way to the bare hide. The next job is to mask out the seats ready for spraying. This is rather tedious work, but essential to get right and done with great care. Applying the many layers of colour. The colour is matched by eye, to any area that won't be recoated, in this case, the leather on the glove compartment. Rolls-Royce actually have paint codes for their leather, but it is impossible to use a tin off the shelf to get a colour match. Over the years the leather in the car changes colour, so this can only be used as a base to which tints are added... and in this case Darrell actually started from scratch. This is a highly skilled job which takes patients and experience. Darrell will add tints of white, black, red and purple until he gets the correct hue. He will then brush a small area, and wait to see how it looks when dry before making any adjustments. Often he may adjust the formula as he goes because different areas of the car will have different exposure to the sun, meaning that door panels are slightly different colour to the seats. Another factor is the degree of matting agent to use. Most cars these days have a satin finish, some may even be matt. But as we sit on them, they become shiny. Most leather conditioners, feeds and even some leather cleaners will make the leather more shiny than the original. It was then left overnight to fully cure, then the masking could be removed and the seats re-masked up for stage two and another day of spraying. It needs to be left overnight in this instance because it needs to be tough enough to put the masking tape on. 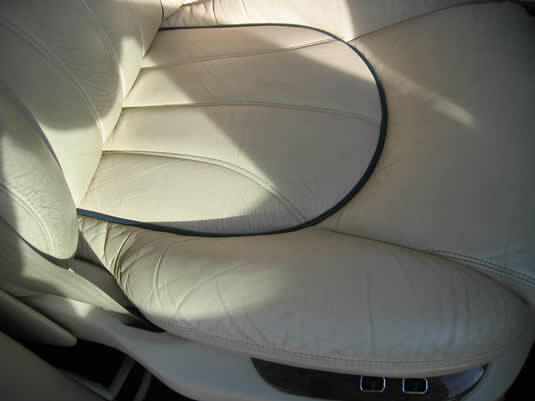 But in the case of most of the interiors we do, the leather is a single colour and we can do the car within a day. Because the leather is sat on, it needs to be hard wearing and a special hardwearing and flexible pigment is used. It's the same brand as applied at the tanneries which supply to the major car manufacturers. As already mentioned, the prep is important, especially so for ensuring that the colour is hardwearing. It also needs to be applied in multiple thin coats otherwise it will 'skin', drying on the surface, but not drying underneath. 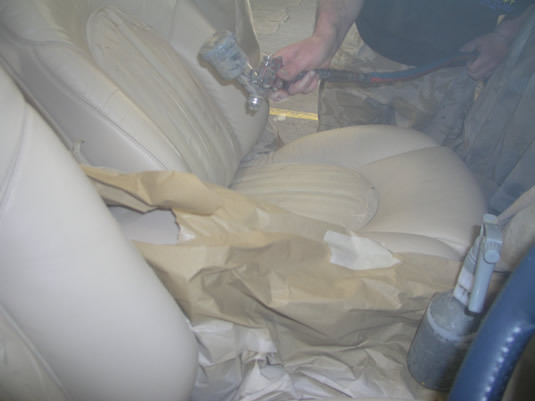 On this particular car, the colour was first sponged on to the bare areas in two coats, and then a further five coats were sprayed on using a professional spray gun. Finally, the pigment is brushed onto the piping by hand... a very steady hand! Obviously a mistake or slip of the brush at this stage would be a disaster! Again, the colour for this was mixed by eye to the larger areas of blue detail on the dashboard.